I hope everyone had a wonderful Christmas surrounded by the people and pets you love! We sure did here at the Squash House! We have two traditions. The first is that Mr. Squash stays up until midnight when Sasha and Gracie May have their once a year talk with him. They present a list of non-negotiable demands which he promises to uphold! 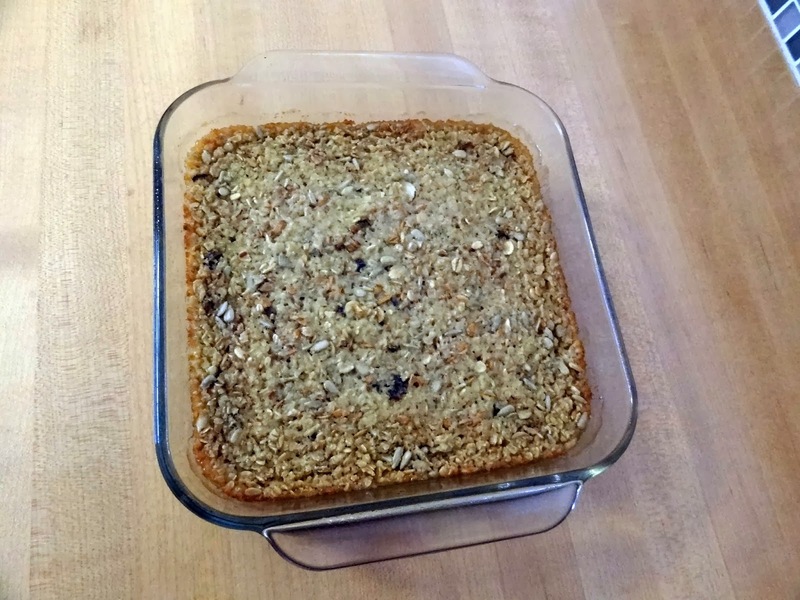 Our other Christmas tradition is to have baked oatmeal for breakfast. This year I decided to change up the recipe I got from Cooking Light magazine, Oct 2003 issue. I've had a bag of Bob's Red Mill Old Country Style Meusli that we've been working on and it occurred to me that I could use it in the recipe with some modifications! First place 1 cup of quick cooking oats and 1 cup of Bob's Red Mill Old Country Style Meusli in a medium bowl. 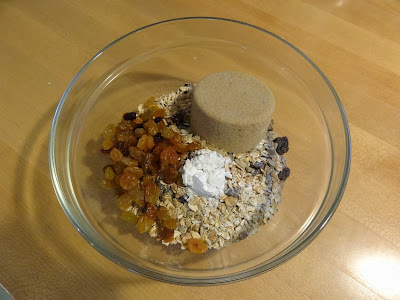 Add 1/3 cup golden raisins, 1/2 cup brown sugar, packed and 1 teaspoon baking powder. Mix together. 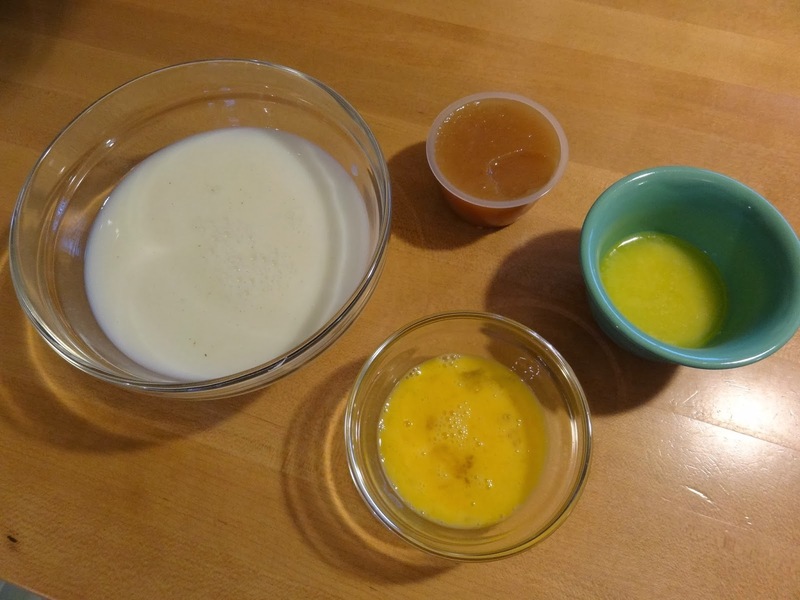 In another bowl mix together 1 1/2 cups fat-free milk, 1/2 cup applesauce (I always keep the little 4 ounce cups of applesauce that come in a 6-pack around), 1 egg lightly beaten, and 2 tablespoons butter, melted. I mix the first three ingredients together first as the butter is usually pretty warm from the microwave. Mix in the butter slowly to temper the egg, otherwise you'll wind up with scrambled eggs. Combine both bowls of ingredients. 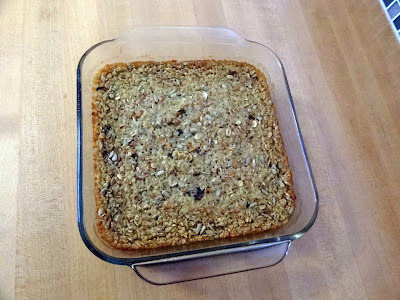 Pour into an 8" square baking dish that has been coated with cooking spray and bake at 375 degrees for 20 to 30 minutes. Since we're at a little over 1,000 feet altitude it took the full 30 minutes to bake. It's done when the edges are golden brown and it's completely set. Scoop into bowls and enjoy just as it is or top with fruit and a little milk! For Christmas dinner we had a wonderful prime rib roast. 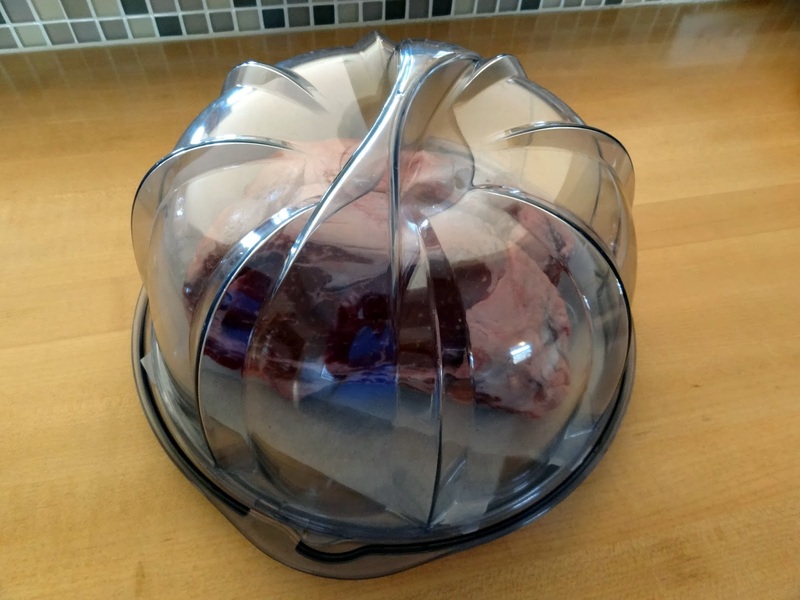 In order to bring it to room temperature before cooking, I had to devise a way to keep the curious kitties away from it. My cake plate worked really well! There isn't anything they won't go after, especially Sasha! Usually when I take something out of the oven to cool it has to go directly into the bathroom on a rack with the door shut! Speaking of the cats - I was having a terrible time crocheting around these two (just use your imagination as to how) until their Auntie Stephanie came up with a wonderful idea! She suggested making a ball of yarn they can call their own! What a brilliant idea! As you can see above, it seemed to entertain them greatly! 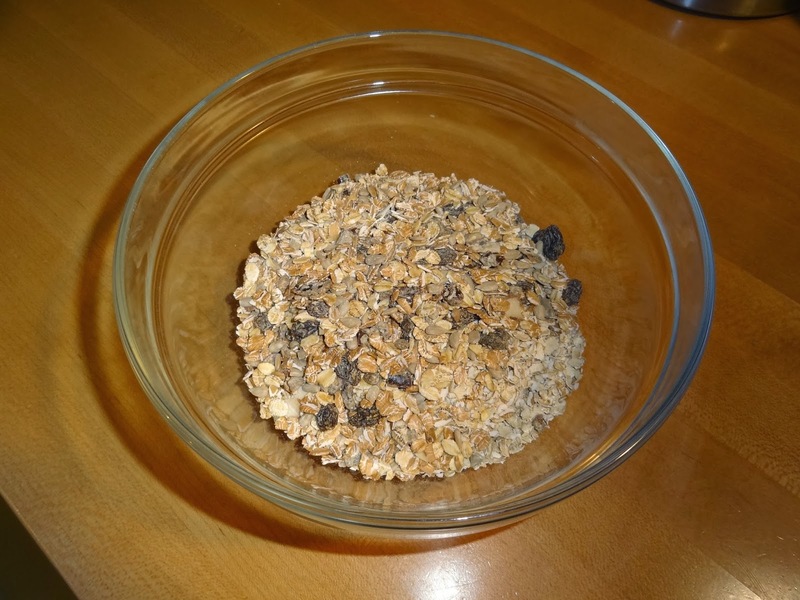 Combine first 5 ingredients in a medium bowl. Combine the milk, applesauce butter and egg. 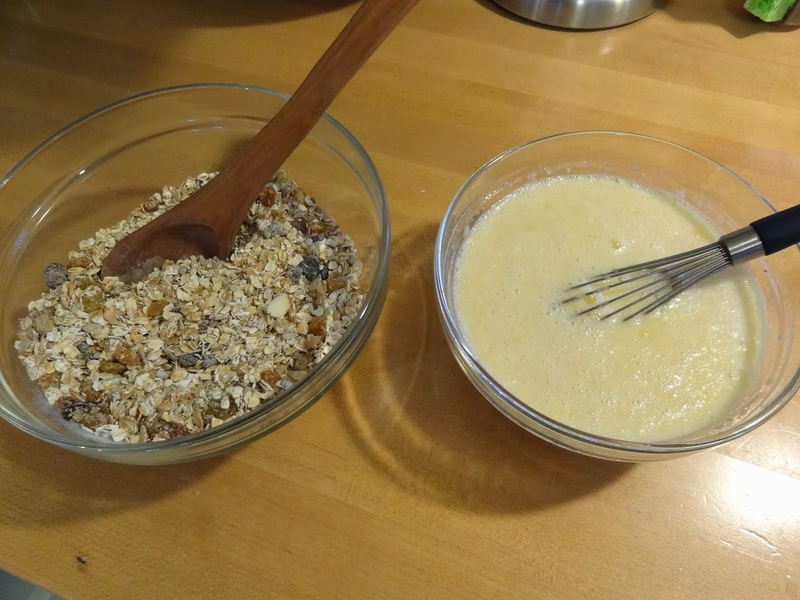 Add milk mixture to oat mixture; stir well. 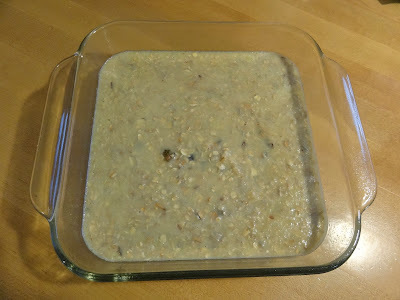 Pour oat mixture into an 8-inch square baking dish coated with cooking spray. Bake at 375 degrees for 20-30 minutes or until golden brown around the edges and set (check at 20 minutes). Serve warm. Makes about 5 servings. Happy Day After! Curious kitties keep you on your toes. :o) I think you had a delicious day and no doubt the girls provided the entertainment. Hi Candace - hope you had a wonderful Christmas! I know exactly how you feel about those curious kitties. We tend to "hide" everything from them in the microwave. Great idea to give the girls their own ball of yarn! They are so cute! All I need is the muesli which I'll pick upon our next trip to the supermarket. Looks and sounds yummy. I'm afraid to ask because you never mentioned it but did your new furniture arrive in time for Christmas? Your Christmas morning muesli sounds delish. Thanks for sharing the recipe and pics. Great idea from Stephanie about giving the girls their own yarn. Can't wait to see your progress on the granny stripe aphgan. I've had to sacrifice a less expensive ball of yarn to keep the kitties away for the good stuff. Makes a great cat toy. Sounds pretty darned good..think I will have to give it a try Happy New Year!